Nowadays there are actually no rocks on this boggy top. The name was reported as Corriganoura by Price's informant (PNCW). Corrig Mountain is the 257th highest place in Ireland. On its own, like a lost puppy! As mentioned already, this mountain seems only to be visited as part of another trek. All the same it is worth the effort to go to the summit. I went there from the summit of Seahan and it takes only a few minutes across the saddle. The middle of the saddle can be a bit soft and wet under foot, but nothing to taxing. There is a clear path straight from one summit to the other. 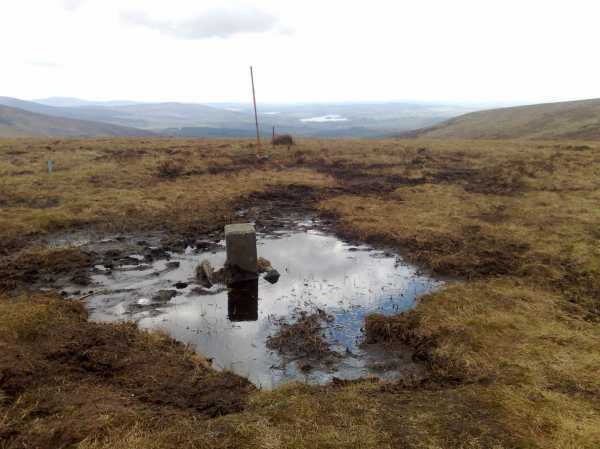 The summit needs a little TLC as there is a small quagmire surrounding the marker point.